Ah, Monday, Monday, y’all. Are you feeling the post-Super Bowl blues today? I’ve always wished they would start the game at 3pm instead 6-something… after all, Sunday is a school night! Anyhoo, we had a super busy and kind of “off” weekend. And as I was catching up on some blog reading yesterday afternoon I was seeing several “What’s Saving My Life Right Now” posts. Anne Bogel of Modern Mrs. Darcy blog started doing this and now has a link-up that has all kinds of bloggers sharing their life-savers. And after the last several days of putting out proverbial fires in my world, I thought a positive focus would be good for today. So here we go! 1. Space heaters. Our heat has been on the blink and finally went kaput last week. And wouldn’t you know they can’t fix it until TODAY. So with temps in the 20’s at night and 4os during the day (hello, February), a couple of space heaters have kept my fingers and toes from falling off. 2. My Sugar Paper planner. I was thinking of picking up bullet-journaling this year, but couldn’t quite give up a structured calendar/planner. This one actually helps strike a bit of a balance. 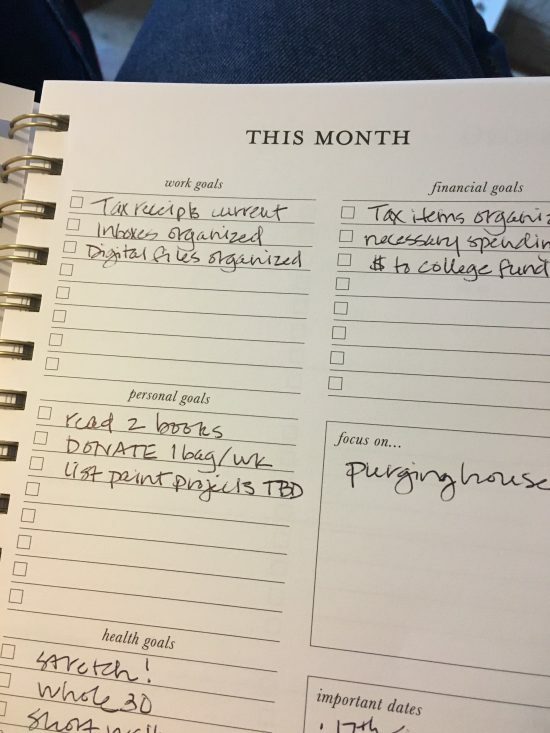 I love the goal-setting pages at the beginning of every month AND beginning of each week. It’s definitely helped me keep my focus during the week by making me articulate my goals and prioritize tasks. It’s become my Sunday evening wind-down to brain dump my to-dos for the week here. And additionally there’s a “notes” section of blank pages at the back where I can create a mini-bullet journal with all those lists I love to make. Mine is similar to this one at Target.com. 3. Dry Shampoo. I wash my hair less often during the winter months as it really doesn’t need it as often (plus I’m a tad lazy at times! ), but dry shampoo helps it keep some volume on the in-between days. Right now I’m using this one from Living Proof. It’s a tad pricier than your drug store brands, but I do think it works better without weighing my hair down. 4. Reruns of my old favorites. I know everyone is all about This is Us or some of the bajillion shows on Netflix or Amazon, but I guess I’m seeking the comfort of old favorites. I’m looking at you, Will & Grace and Friends. And also you, You’ve Got Mail and Notting Hill. 6. This “how to beast Monday” cheat sheet. I just read this last week, but I feel so empowered with these tips on how to ease into my week. Because Mondays can be rough, no? 7. A husband that’s willing to cook dinner. I’ve got a lot of irons in the fire right now and often come dragging in completely uninspired to whip up supper. Truth be told, I’m usually good with a snack of sorts in the evening, but the hubs wants a full-blown meal. And lately he’s been handling that pretty well — whole 30 and all! And so there it is… what’s saving your life right now?? can you believe that i have not tried dry shampoo??? also, i wasn’t sure i should tell you but you can’t have hummus on whole30 because it’s a legume. i am sorry to be the bearer of bad news!